If you are looking for an economic and nippy little car to get about town in then the Fiat Punto is one of the models you might be tempted to have a look at, not just because of the purchase price but also because of the insurance group. 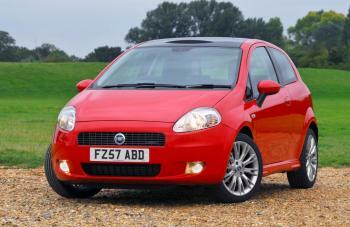 We’ll start off with a short review of the Punto and then we’ll look at the Fiat Punto insurance group. The Punto is a supermini which has been popular in a number of countries including the UK since production started back in 1993. Well over 8 million of them have sold since then. It was named as European Car of the Year in 1995 and its popularity shows no signs of slowing down. However, is it the right car for you if you want a great vehicle that is one of the cheapest cars to insure? When you think of an older style Fiat Punto you might think of a fairly basic, boxy model. You wouldn’t be too far away with this description but it is a more appealing car than that makes it sound like. The entry model versions were immensely popular and the insurance rating is pretty reasonable. You can expect these cars to fall into somewhere between group 6 and 8 with most insurers. However, some of the older cars in this range offer surprising features such as turbocharged engines, sporty performance and ever convertible roofs. Of course, these models are going to be more expensive to insure than the more basic ones. The later models of this car are better looking and have been praised for the deceptive amount of spaciousness inside them. The relatively low price tag should be enough to tell you that these are still marketed as being fairly basic vehicles without too many fancy trimmings but which do exactly what you expect of them. The modest size of them means that parking is never too much of a problem. The performance and the handling are steady without getting close to anything which we could genuinely exciting. The newer versions of the Fiat Punto will often be found in either insurance group 6 or 7. Remember that 1 is the cheapest insurance group and 50 is the most expensive. For example, the 2013 version Fiat Punto 1.2 Pop is usually group 6, while the 1.2 Easy from the same year is generally rated as an insurance group 7. Higher end models such as the 1.3 Multijet 85 can come in as high as group 13. If this is your first car or you are a new driver then the difference between these groups will seriously affect the final premium you are quoted. Because there are a number of different models in the range it always makes sense to get a quote for the exact Fiat Punto model that you are interested in buying, avoiding any nasty surprises. Generally speaking though, they are among the best value vehicles when it comes to insurance. The Fiat Punto is typically called an ideal first car and there is absolutely nothing wrong with that. If you think about it, most of us want our first car to be good value, reliable, cheap to insure, easy to drive and low cost to run. The majority of the models meet this criteria and it isn’t just first time car buyers who like them either. If you want a decent looking, reliable car which doesn’t cost the Earth to insure or to run then the Fiat Punto could prove to be the right car for you. There are lots of them for sale across the UK, so you will be spoiled for choice if you start seriously looking for one to buy.